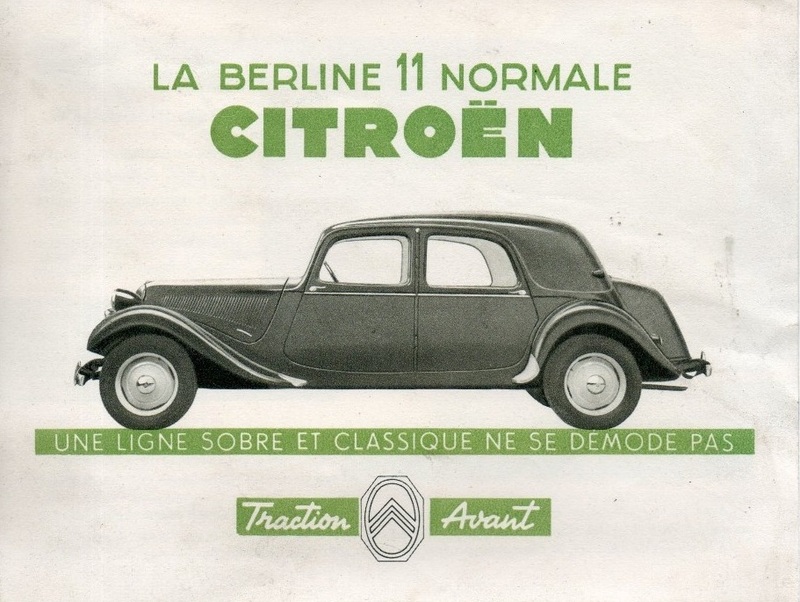 This is the ultimate Traction, the last pre-war Citroën. 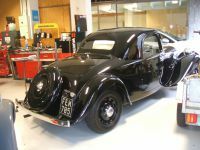 The 15-Six came out in mid-1938, four years after the first Traction-Avants, and was the top of the Citroën range until 1956. On twisty European roads, few cars could outrun the 15-Six. It was soon called “la reine de la route,” the Queen of the road. Never mind that it looked like it was stuck in 1934 – it sure did not drive like it. And so what if it was barebones inside – it was a Six, therefore de facto part of automotive aristocracy, way above puny Renaults and Peugeots. This 1950 Citroën 15-Six is almost the archetype of the species. It’s black, it’s got more chrome than its lesser four-pot “11” siblings and its long hood is home to a 77 hp (SAE net) 2.9 litre in-line OHV six. That was over 20 hp more than the 11 range. The 15-Six was also around 30% more expensive than the 11. Many owners have secured the “15 6 CYL.” badge somehow (this one with some discreet metal wire). It was made to be detachable as it masks the crank-starter hole, making it easy prey for thieves. These cars rarely need a crank start anyway. The small winged emblem below masks the original hole in the grille from 1938, which moved a few inches higher when the engine’s rotation was reversed in 1947. The best-looking angle of this particular car is the rear – this is a “malle plate” or slantback, with its spare wheel on the outside. The looks of the Traction Avant were not aided by the later “malle bombée” humpback design of late 1952. These being more recent, they represent a large portion of the survivors. Many cosmetic changes, such as that new boot, were applied to all Tractions over the years – the 4-cyl. 11, which came in two different unibodies, and the 15-Six. Telling a 15-Six from the big 11 “normale” is not always easy. Citroën 11 B “normale” (top) and 15-Six. Same body, same year (1951), different engine. One key difference is the Six’s longer, more prominent and (after 1947) fully-chromed nose. The noticeably thicker side chrome strip and hubcaps are also a good tell, as are the post-1950 chunky straight bumpers. And, of course, the large chromed “15 6 cyl” on the right rear wing. This 1950 car has the better, more balanced look. Plus it still has the more graceful bendy bumpers. Originally, this car had traficators on the B-pillars, just above the top hinge. Many cars were retrofitted with turn signals even back in the ‘50s; almost all now have a right-side tail light too, which were only fitted as standard by Scrooge McMichelin on the Traction from 1954. Inside, this car was not a super-luxobarge like those decadent and expensive Hotckisses and Salmsons with their leather seats, wood trim, radios and other gadgetry. No, this was not the Michelin way! The tyre-maker that ran Citroën at the time were an austere bunch, and this was reflected on their product, which was relatively low-priced anyway. Black enamel dash, no distractions except for a couple of measly vertical chrome strips and a life-threatening device combining the windscreen vent screw and a (pretty useless) rear-view mirror. Out of shot, just above this contraption: a rather massive electric wiper motor, sticking out in a similarly menacing way between a pair of (also pretty useless) sun-visors. These cars had a very nice gray/brown velours upholstery, which did not age very well. 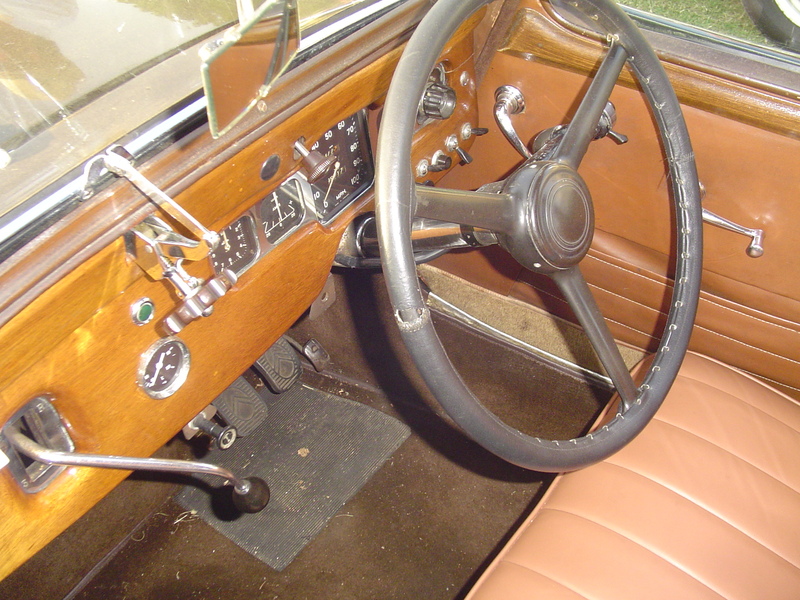 Very few cars still have their original velours interior. This one definitely does not. The flat floor, incredible amount of rear legroom and massive C-pillars helped make the Citroën a top choice for chauffeur-driven executives and politicians. This car is missing the aluminum trim piece that should be on the base of the fenders, making it even more black than it should be. Taking a page out of Henry Ford’s book, the Michelins wisely limited the choice of colour to “any as long as it’s black” for the 15-Six since its launch. After the war, the 4-cyl. range also went completely black. But it went back: two shades of both blue and gray paints appeared on the 1954 options list. This was only the case for French-made cars though. Belgian- and British-built Tractions were better appointed, and are extremely desirable today. 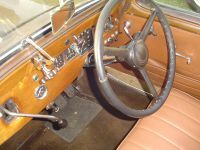 The British Citroën Big Six had to compete with the likes of Alvis, Humber and Jaguar, so it eschewed the utilitarian interior of French Tractions, going for full leather trim and a completely different instrument panel in varnished wood. The 15-Six’s major shortfalls for a 21st century driver include fuel consumption (around 12 mpg at highway speed), the unsynchronized first gear, a very firm suspension (except the very last hydro-pneumatic models) and the very heavy steering. If you can live with that, then you can be the Queen of the road’s consort. Coming very soon: the complete Automotive History of the 15-Six. Because it’s worth it. Thanks, Tatra87, for pointing out the visual difference between four and six-cylinder models. Now, I can spot the difference should I sight another Traction Avant. The one I rode was 1954 11CV 4v (perhaps fourth revision) as confirmed by the owner in the e-mail correspondence. He also pointed out that newer 11CV has larger rear windows than 15CV, which should make the identification possible from the rear. I doubt that it’s the case anyway, as it would mean that the unibody would not be common between the 11 B (Normale) and the 15-Six, which doesn’t sound right. However, the 11 BL (Legere) and the 15-Six are completely different, though the one with the larger (actually a little wider) backlight would be the 15-Six. Maybe you had a ride in a 1954 11 Legere? Great article! I was the poor victim of some unrequited Citroen love when I saw what I assume was a Traction Avant on an open transporter driving near my house about a month ago. They’re weird (in America, at least), but I think they’re beautiful. Easy to see why this didn’t sell in the US. Compare the interior with a ’50 Plymouth or Chevy, and the Citroen loses in every department. The dashboard looks like the controls for a lathe or printing press. Cars were supposed to be an escape from work, not a replica of your workplace! Different tastes my friend. In Thirties France and the rest of Europe this car was light years ahead and produced until the DS of 55.
ago leaving all UK models coming in from France. Just Google and Wiki. Interesting stuff….. It looks like seeing out the back when making traffic manoevers would be problematic . I only know of two Traction Avants in Los Angeles although there must be more . At least those two get regular use . Doesn’t look like the driver has much leg room. Look how far back that gas pedal is !! I remember seeing a few of these in Turkey during the 60s. Many had replacement tail lights from VW bugs. I remember a cream-coloured Big 15 which was a regular fixture in Calais about fifteen years ago. Heavy steering? Understatement of the century! It was easier to drive the wretched thing round the block than attempt a three-point turn. Lets give a lot of credit to the French for getting their industries, including automotive, up and running after WWII. I know the Marshall Plan was important but many, many Frenchmen worked incredibly hard just to get the economy going. Hats off to them!! Serious question: What is/was the point behind reversing an engine’s rotation as mentioned in the text? Yes Jim, that Traction you snapped in Paris was a 1954-56 15-Six, no doubt about it. Looked like it lost its grille emblem. Re: the engine’s rotation, have a look at my forthcoming post — the Automotive History of the 15-Six. Beautifull cars, there are a couple of Traction Avants in a local classic rental fleet but I’m sure they are fours, I must take more notice next time I’m past their hideaway, I still think the prewar coupe I saw recently is the best looking example of the TAs. It’s amazing to see how austere this was inside, and even more so considering the DS was only a few years away. The MKZ and Continental look considerably different but I get what you mean by untrained eye. However, then it’s really no different than ze Germans and their same sausage different lengths approach. Wonderful cars, and so important in the development of the modern car as we know it. What I always wonder is how did this look in 1956, when the DS came out, looking as it did? By then the Traction Avant may have been still advanced in many ways, but style wise it was very dated. “The complete Automotive History of the 15-Six. Because it’s worth it.” It most certainly is, and I think you’re the Curbivore to write it. So, no pressure! The Traction Avant was already looking a bit dated in 1939, really. After the war, the French motoring press were always dissing Citroen for having such a modern car with such outdated styling. Citroen themselves had looked into integrating the headlamps into the wings as early as 1935! It made the DS all the more interesting when it finally came out, I suppose. Where’s your photo ? . I suppose the visual id is further confused by all the British built cars having chromed grille and extra trim, rather like the French 6-cylinder cars.